Show and tell! - Page 5 - Lampwork Etc. Very nice pens. Funny, I have had pen making on my mind, the kind that holds can ink cartridge, lately. I bought one on vacation in Kauai for a model but it rolled off the table and broke. Yeah, the wall thickness was too thin. Wow, its been quiet in here. Here are a few more shawl pins (or hair sticks) and a couple of brooches. What have you guys been up to? My dietician said I should kick the artificial sweetener habit so I did some spoons to use in my sugar bowl. Those are very cool. What a great idea. Love the leaves and the spoons! Also weird because I made 2 spoons this morning! not unlike those but definitely not as nice. Thanks. 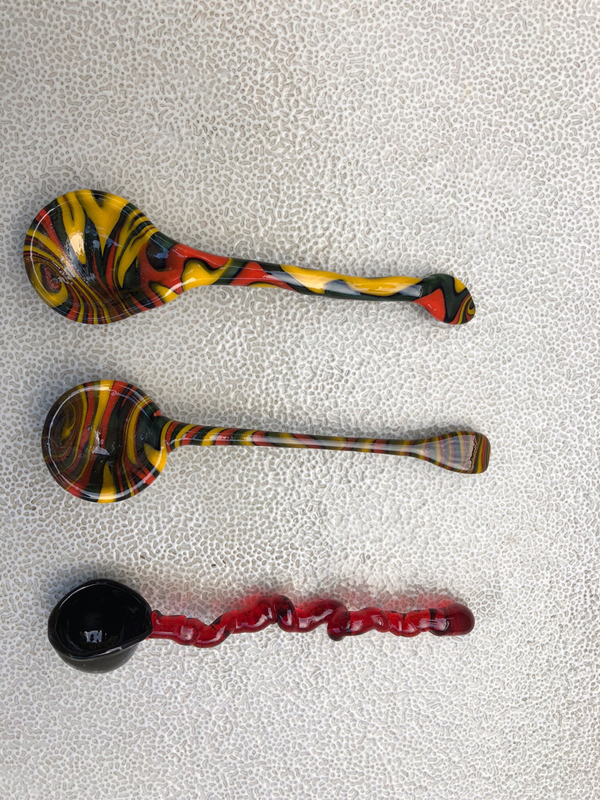 If I was to get, “in the business” of making spoon, I’d have some practice to make them more professional but I’m pretty happy with them for personal use. Haven't had sugar in months. Those are kinda full anyway, hard to tell from the pic? but the frit and things are set in resin.